The Hook in golf is like the treacherous villain that steals your little happinesses with every shot on the golf course. Although there’s scope to use the hook to your advantage, it often wrecks incalculable damage to your game. Your golf ball constantly veers off the target at the last moment, a prospect that gives even the top golfers the jitters. Ben Hogan is a prime example of the fact that curing hooks drastically changes someone’s game. While high-handicappers often struggle with slices, the hook is a thorn on the pro golfers’ sides. The first step to solving any problem is understanding its base causes. In this post, we delve deep into what causes hooks. The incorrect swing is one, but the mistakes that lead to the incorrect swing are many. We explore these common mistakes in detail and give you tips to remedy them one-by-one. We bust some myths about what prevents a hook in golf. We look at some drills that will help you iron out the kinks in a smooth swing that drives the golf ball straight along the target line. We close off with some encouraging advice on how to keep your momentum and control the hooked shots to your favor. 1. What is a hook in golf? 2. What causes you to hook the golf ball? ​What You Will Need To Stop Hooking The Golf Ball? Remember watching in desperation when you hit a ball, it seemingly goes straight and suddenly makes a wide curve from right to left and keeps curving until it stops? That’s a hook. When the ball just flies left at impact, at an angle from the target line, it’s simply a pull. A severe case of a hook is also called a snap hook. A too strong grip will automatically pave the way for a hooked shot. If you are set in your grip, you have to make up for it somewhere else in the swing. Closed clubface is known to be the most critical reason for hooking the golf ball. A closed clubface automatically faces somewhat left which causes the ball to curve the ball right to left. An inside-out swing path will lend a right to left spin to the ball. It’s difficult to have a neutral swing path. So, you have to work around your swing characteristics to stop hooking the golf ball. The first step to solving any problem is understanding its base causes. In this post we delve deep into what causes hooks. The incorrect swing is one, but the mistakes that lead to the incorrect swing are many. We explore these common mistakes in detail and give you tips to remedy them one-by-one. We bust some myths about what prevents a hook in golf. We look at some drills that will help you iron out the kinks in a smooth swing that drives the golf ball straight along the target line. We close off with some encouraging advice on how to keep your momentum and control the hooked shots to your favor. Whichever clubs that give you the most trouble while taking a straight shot should be tackled first. Take each one in turns and practice the correct swing dynamics with each club so that you get a clear idea. Also, ensure that you have a proper set of golf clubs. It’s important to invest in the right kind of golf ball. Beginners fare better with low compression Surlyn balls that reach longer distances. Pros opt for high compression Urethane balls for better control. You should practice these tips on how to stop hooking the golf ball in open golf courses or practice ranges. Practice net at home will not give you a proper idea of how your golf ball is flying. It doesn’t grant you the satisfaction of seeing your hook improve into a draw and then disappear completely. Smash bags and alignment sticks can help you in some drills to stop hooking the golf ball. The silliest mistake can be causing the hook. Look at the way the clubface is angled behind the ball at the target line. For this, stand in the neutral address position, and fold up your arms holding the club as it is until they reach waist height. At this point check if the clubface is completely perpendicular to the ground. If it leans towards the ground, you have a closed clubface and a fair chance of firing a hooked shot. To stop hooking the golf ball, ensure that the base of the clubface is completely perpendicular to the target line. Repeat the above exercise and make sure that the clubface doesn’t lean towards or away from the ground. Check how you hold the golf club. If you can see three or four of your left hand’s knuckles but only one knuckle of the right hand, you are aiming for a hook. 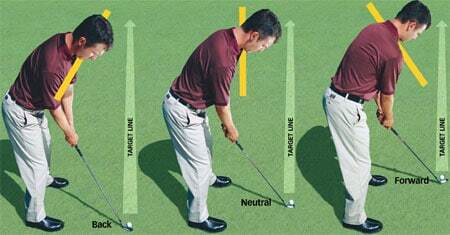 This indicates that you are holding the club with your right hand from underneath the club and hence tilting your body. This creates too strong a grip which misaligns the club in the backswing and promotes an inside-out swing path. At impact, your arms will be turned to far away from the target line. When you have a really strong grip, you find your right shoulder leaning towards the ground and left shoulder leaning up. Another common mistake in the stance is having your legs positioned at an angle from the target line. When leading leg edges closer to the target line, it automatically creates a closed clubface with the ball. At the address position, make sure that both your shoulders are at the same level from the ground and aligned in a straight line parallel to the ground. This also indicates a neutral grip and helps tame a hook in golf. The line of your feet should also be parallel to the target line. Use an alignment rod if required to align your shoulders and legs. Make sure you transfer your weight across your legs in the same momentum effectively while moving the upper body. Check out our How to Drive a Golf Ball Straight post. Here we explain how to make your swing straight through all phases of the swing. It helps you create an effortless swing that doesn’t have deliberate twitches that can close the clubface midswing. There are some drills that help you move the upper body and lower body in sync. We checked out a few drills that will help synchronize the momentum of upper and lower body effectively. Hold the golf club straight in your arms parallel to the ground. Get in the neutral stance at address position. Now swing the clubhead such that it reaches directly above the golf ball on the target line. You will immediately realize when you move the lower body too quickly. A hook is rarely useful. But its tamer cousin, the Draw, is quite useful. A draw shot (or a controlled hook) is different from the hook in that, it goes straight farther before curving right to left. This can come handy when you want to avoid hitting into trees. It’s difficult to hit a straight shot all the time. A Draw shot is useful when you want to damage control on a curved shot.